Im going to go into some advanced strategies and tactics used by professionals to get more customers in the printing industry. I want you to think about getting more printing customer like water dripping down a funnel. The water is the conversations you need to have with potential prospects everyday. Your job is to keep the water flowing. Once the flow stops at the top of the funnel, the water at the end of the funnel also stops and so does your sales. You need to keep yourself in a conversation with old customers as well as new prospects. I’m going to show you comprehensive advanced strategies on using different channels to get orders and sales coming in for the printing industry. I’m also going to assume you have basic knowledge and experience in getting new customers, so a lot of basic tips such as setting up an Adword account is not going to be a part of this article. Let’s say i’m the owner or manager of a commercial printer and I need new customers coming in. I have decided to add magnetic printing to my list of products on offer. 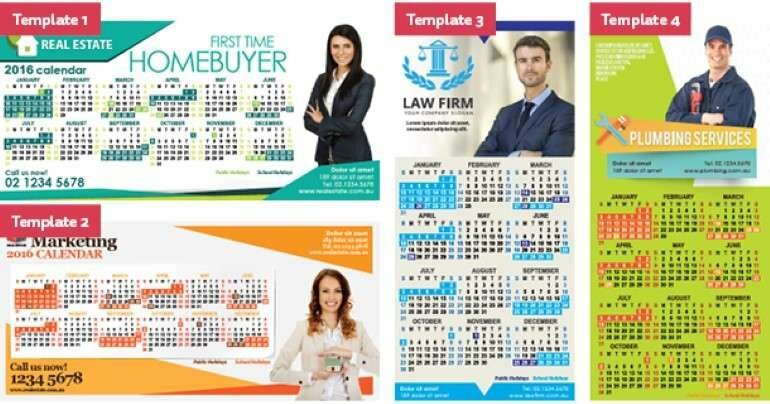 I know my biggest customers are real estate agents and local business owners who needs to print magnetic real estate calendars for direct mail. One of the fastest ways of getting new customer inquiries is through Search Engine Marketing. When people search for a query, your ad shows up on Google. Let’s dive into some advanced tips on how to get this process started. Here you can see the monthly search forecast for this keyword in the United States. For the printing industry, we suggest you target everyone in your state. For example if you are in Houston, it is recommended you target all searches in Texas. Since this is a specialty product, you can target the entire US if you want, but you must figure out the distribution costs and if its justified. Now you want to make a campaign called “Magnet Printing” with a adword group called “Magnet Printing - Exact”. 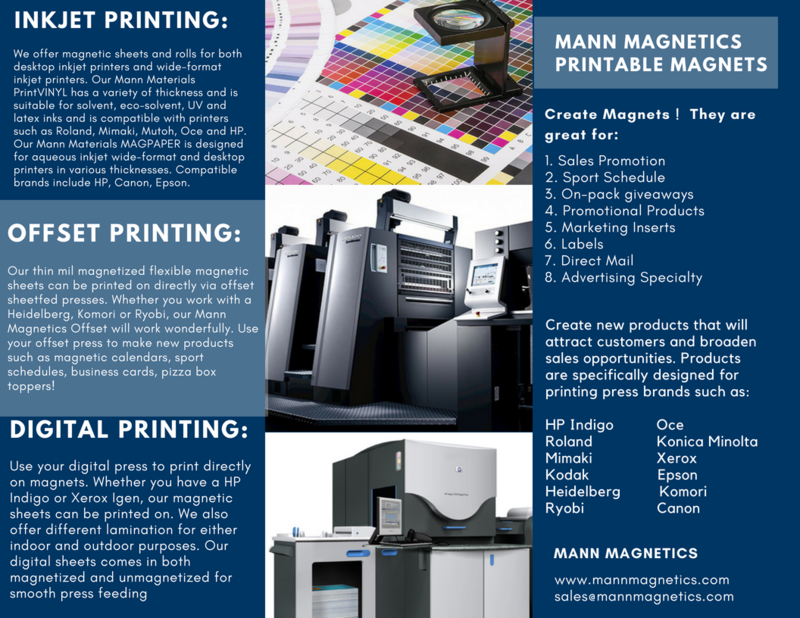 In this ad group you only want to target the people who searched exactly for keywords such as “magnet printing” not “free magnet printing” or “magnet printing for cheap in NY”. By targeting the exact keywords, you are likely to see a high Click Through Rate. 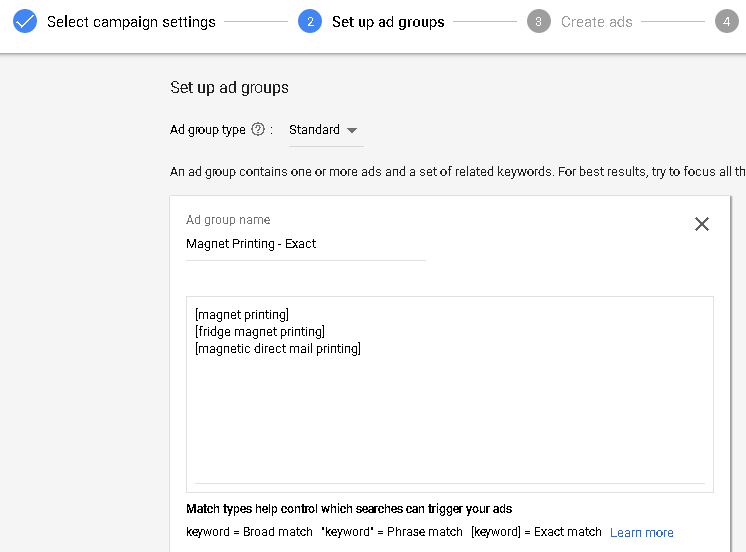 Now you want to create another adgroup in the same campaign called: Magnet Printing - Exact Modified"
This will show ads for people who searched for everything in the modified broad match minus the exact keyword searches (which is already in the first ad group). We do this because we want to see what keywords are being searched and clicked on that is not the exact keyword but similar to the exact keyword. 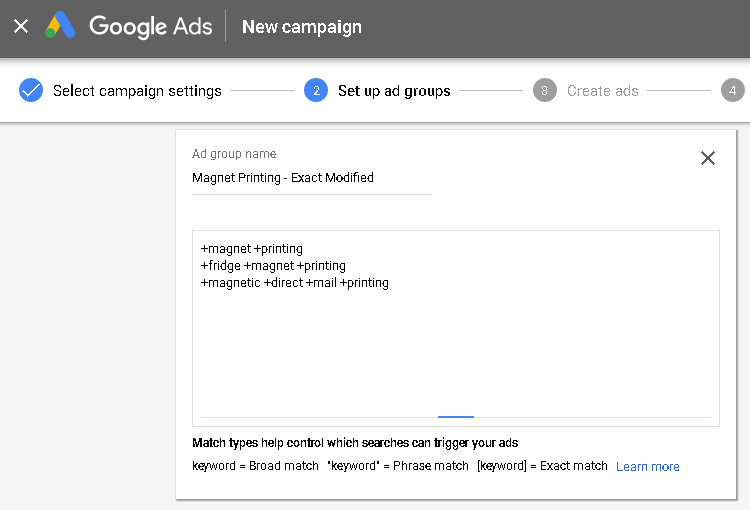 Now, think of other keywords that is relevant to magnets and create multiple campaigns at the same time. 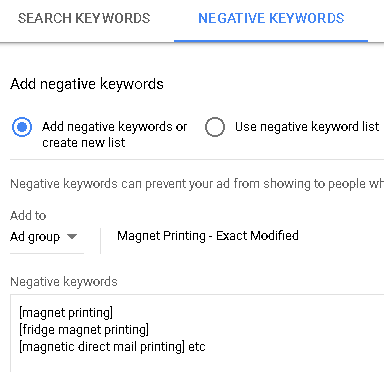 Because the keyword “printing magnets” may not have sufficient search volume for you to see an increased jump in customers coming to your website, test out other possible keywords such as “realtor marketing materials”, “marketing for real estate’ etc. Make a landing page with an email capture form, phone capture form and your phone number. After about a month or so, optimize and pause the campaigns that didn’t get many clicks and increase the bids that are doing well. For keywords that has a bigger volume, have a look at Bing. The cost per click is much cheaper than Google. Test out Google banner ads to see its effectiveness. Also add a pixel and use retargeting. 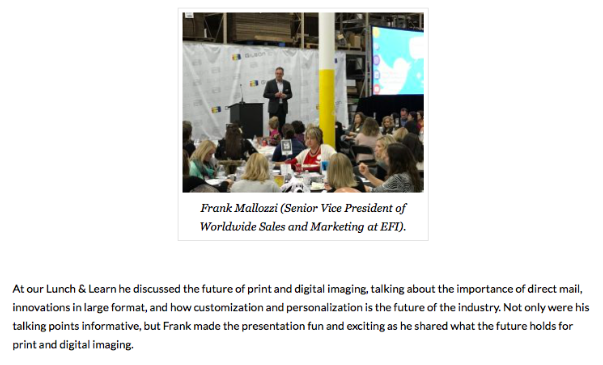 Lunch & Learn is a great way to meet your potential customers face to face to demonstrate your capabilities as a printer. It also offers a great way to sit down and show them any new product offerings. Lunch & Learn is suppose to be personal and in a small group. Panera and Bruegger’s is one of the few companies who can offer corporate catering menus. Along with these events, always make sure you bring enough physical marketing material that they can bring back home. 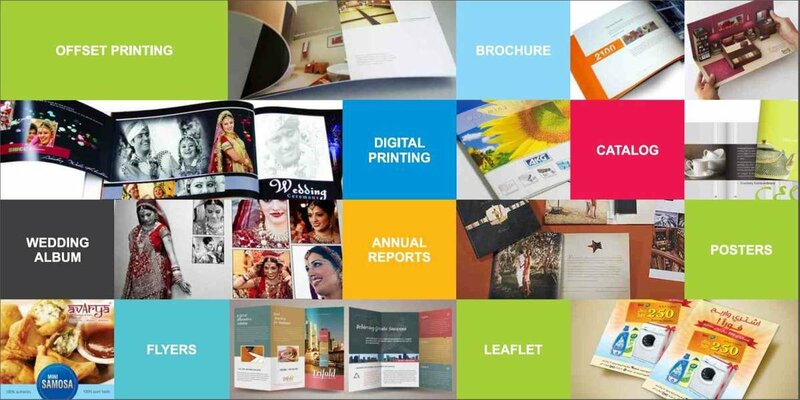 This includes flyers, business cards, printer capability brochure etc. You also want to bring examples of past work that you have done. For example, if you helped ABC dentist print 10000 pieces of fridge magnets for a direct mail campaign last year, then bring a sample of those along. Along with each piece of material should be linked to a presentation or explanation of the end result of the printed campaign. Eg. ABC dentist spent $2000 on printing, $2000 on mailing the 10000 pieces of fridge magnets, and they received over 200 new customers as a result. Demonstrate to your customers that your printed material is useful and was able to generate a positive return on investment. You can now promote your Lunch & Learn via phone, email or social media. Another tip i can recommend when doing Lunch and Learn is to reach out to local journalists and people who are working for local radio, tv, magazine or newspapers. If they ever wanted advice or your feedback in the future with the industry, the first person they call would be you. This, in turn, generates good local publicity. Firstly, you want to set up a CRM if you don’t have one. All emails will need to end up going into a CRM so that you can manage your pipeline. CRMs i recommend include Hubspot if you want a simple and free one. Others include Salesforce, Insightly, and Nimble. 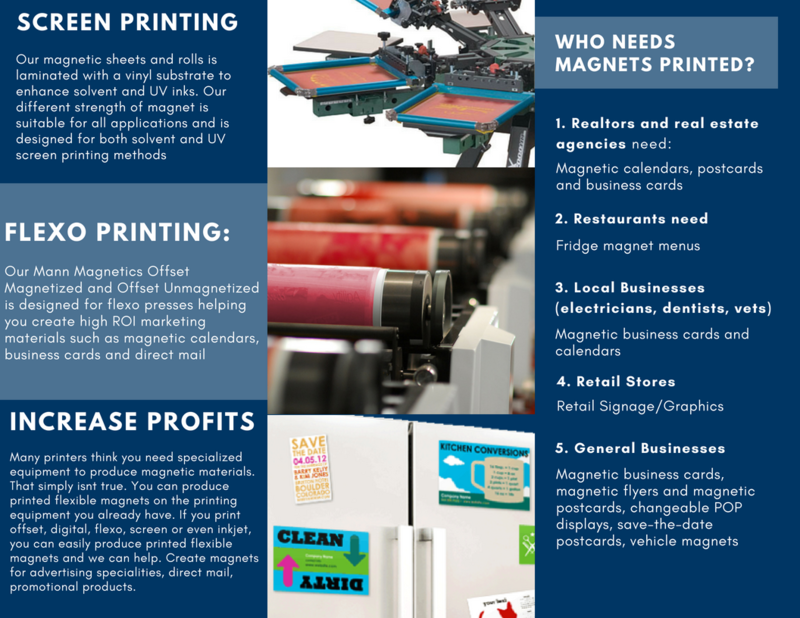 So how do you go about getting an email campaign started if you decide to promote magnet printing to business owners like real estate agents or dentists? One way is to get it from LinkedIn. Once you target your demographic down to occupation and location, there are thousands or tens of thousands of potential customers. Use a Chrome extension such as Getprospect.io or Skrapp.io to find their emails. What if you want the emails of local business owners? One way is to go to a business directory site like yellowpages.com or yelp.com or manta.com. Type in the local post code or surrounding local post codes. Type in the businesses that you need to target and you will get a list of all business listings near you. Many of these listings will have a website URL. Once you have this list of email, you can write a personalized outreach email to these potential prospects. If the email response is positive, move the customer down the funnel in your CRM. Many CRMs have automatic data enrichment. They provide contact numbers of the people who are in your CRM. Now you can either reach out to them via phone to proceed with the sell or reach out via social media. Make sure your email hard bounce rate is below 3-5% and spam complaint rate is below 0.2%. If bounce rate is too high, you can use a service like zerobounce.com to clean your list. If you spam complaint rate is too high, test your email copy. Write personalized short text emails instead of html emails no longer than 3-5 paragraphs with a clear call to action. Send a LinkedIn connection request, Tweet or phone call within 1-2 days of sending the email to increase response rates. If you want opt-in lists, you can buy emails directly from your target customers trade associations. Many trade associations offer marketing programs or lists which you can send emails to. However, these are quite expensive in our experience. 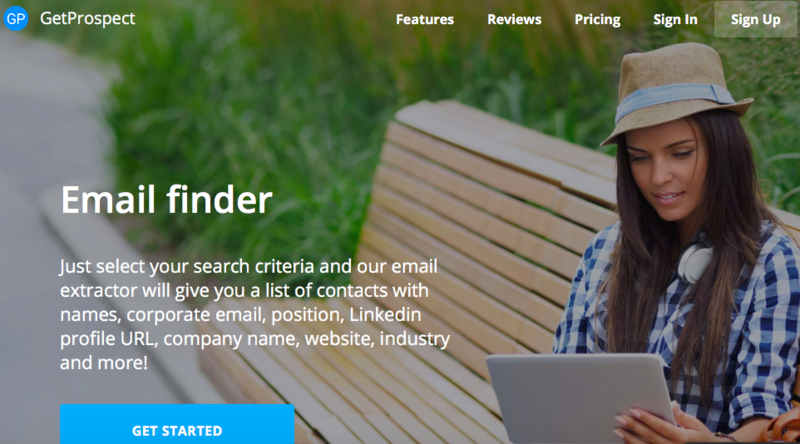 Linkedin is probably one of the lowest cost customer acquisition channel you can find because most of your prospects are already on Linkedin and you just need to reach out to the correct people. If you are serious about using Linkedin, which we highly recommend, be sure to sign up for Linkedin Premium. First, let’s find your target customers. Go and search for real estate agents by either industry or role. Now, narrow that down to your state or local area. We found over 10000 potential prospects in just the San Francisco Bay Area. With all these potential customers, how do you connect with them? I suggest using a few tools where you can get their emails. One of them being getprospect.io and the other being skrapp.io. Both of these are Chrome extensions where it scans their Linkedin profile and it matches the records in their database giving you their work email. 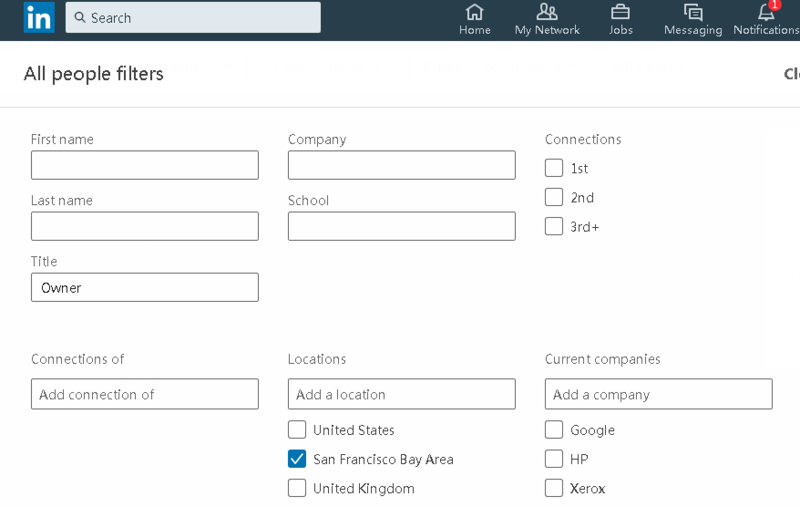 You can also send out connections to people on Linkedin to connect. Once they accept your connection, you can send them an Inmail. Electricians etc and do the exact same thing as above for all these businesses. You can also target businesses via LinkedIn Ads. These ads are every effective since most people on Linkedin are either looking to network with other professionals. They are in a work-related mindset compared to individuals on other platforms like Twitter, Facebook or Instagram. LinkedIn Ads can be extremely targeted since you can target by company and accounts. 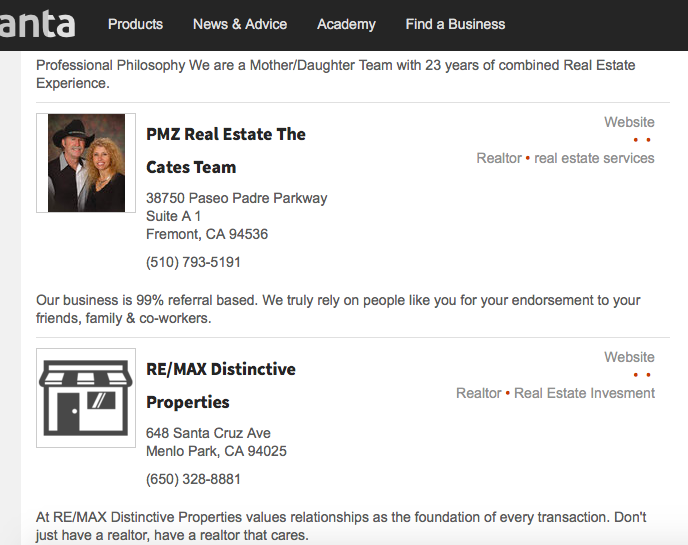 Also another very useful targeting tip is role based: such as Owner of Real Estate Agencies. You can target the profiles of all Owners of real estate businesses geo-targeted to your surrounding area. If you do decide to run LinkedIn Ads, I recommend using Sponsored Content instead of Text Ads. The click through rate seems to be higher with sponsored content. Another thing you can test is lead generation forms where you can capture their details with pre-fulfilled information. The upside of LinkedIn Ads are that the conversion rate is much higher than that of other social media platforms. However, the downside is that it is very expensive. You a looking at $6-$7 CPM (cost per thousand impressions) and if you get a decide click through rate of 2%, the CPC will be $3-$4, which is more than Facebook, Twitter and Google. You can actually build a lead funnel right in Linkedin by using tags. For all the new connections that you have, add a tag to each and every individual. Eg. Tags can be: new prospects, emailed, looking to buy, closed deal. With tags you can classify where the customer are at the stage of the buying cycle and send mass personalized messages based on where they are. Many people recommend making content and posting them in LinkedIn Groups. To be completely honest, I found it a complete waste of time. When was the last time you went into a group and read every article? Probably never. However, that being said, you can create a group based on businesses in your local area. This gives you can excuse to reach out to people on Linkedin to connect. While Facebook is not a conventional platform for B2B marketing, Facebook is a very effective way of targeting potential prospects for very low cost if targeting is done right. First step is to go to Audience Insights and search for anything that is related to real estate agents (or your target customers). This will include associations, magazines, influencers, real estate brokerage firms etc. 1. Import emails of existing customers / potential customers phone number/emails into Facebook to create an audience. You can then let Facebook duplicate this audience based their demographics to expand audiences. 2. As Facebook Ads are becoming more expensive every year, you need to split test ad copies and value offering. There are two types of direct mail that i recommend running. One is a low cost end of funnel campaign and the other being a targeted high value campaign. What do i mean by this? One rookie mistake i see a lot of printing businesses make is to send out 3000 flyers or brochures to local businesses hoping anything will stick. This is the wrong approach and a guaranteed way to burning through your marketing budget. 1. Only target the businesses that have shown a significant interest in purchasing from your business. This may be the businesses who you have contacted on the phone or those who have responded positively to your emails. These “warm” contacts are those close to the end of your funnel in your CRM. Because there won’t be that many, perhaps 100-1000 at most, direct mail such as a brochure or price list can be used as a good way to get them to order. From my experience, sending out direct mail once isn’t enough, and must be done on a consistent,monthly basis, over a period of 6-12 months. Because you have narrowed down your warm customers, if you only need to send 100-1000 every time and 1200-12000 max the entire year. You will find this much more effective than sending out 5000 pieces cold to businesses who do not know you. Also mix up the content being sent throughout the months with prices such as price lists, promotional codes, business cards, magnetic calendars etc. 2. The second way is to laser target extremely warm leads or big customer accounts. These are the people you know are very likely to buy from you. You have either talked with them on the phone at least a few times or have had a decent amount of conversations via email. Since you know exactly who they are and what they do, compile a list of 30-50 people in this criteria into a spreadsheet. Use Google, Linkedin or Twitter to find out as much information about them as you can. Now write a personalized letter saying how you were on Linkedin and saw their article pop up and you thought of them. Now you want to send them a gift along with the letter. This is where you need to be creative. One thing you can’t do is send something generic which is easy for them to throw away. A good example would be a humorous, personalized cartoon that is personally drawn up by a professional artist related to your two businesses. Other examples include personalized jacket with their alumni logo that you found via LinkedIn. The key is to make it personable, of value and impressionable. Forget the mugs, pens and stickers with your company logo on it. Most of it will go into the trash. While content marketing isn’t a channel, it is something that i want to talk about. This is essentially a form of pull marketing because it can educate your customers and guide them to buy the product you want them to buy. For example, not all real estate agents or local business owners know how real estate fridge magnets can help them get customers. It is up to you, as a printer and seller of print material to help educate them on the effectiveness of this form of advertising. They will not buy if they do not know this. 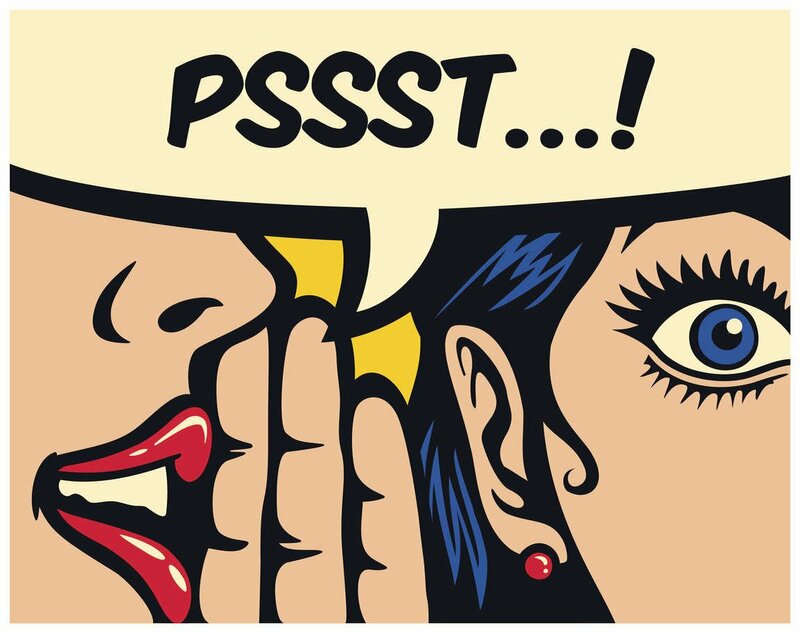 Referrals is probably one of the most powerful ways of generating new prospects or leads. Get out your customer list and make a compilation of your 50 best customers. Give them a call and ask how they thought the last print project was and if they were satisfied with your service. Start with an opening question or statement and state the problem you’ve solved or the need your product/service has met. State the problem: “You brought us in, basically, because of your frustration with the performance of your past printer. And your instincts and data have shown that your decision to bring us in has boosted the quality and profit by 11%. Do you think you’ve seen a good return on investment? Check for agreement and ask for a referral. If they agree with you. Then ask who they now who could use your product or service. Notice we aren’t asking them if they know someone. We are assuming they have plenty of relationships they can pull from. Eg. “I’m glad to hear we’re meeting your expectations. You may or may not know this, but our company is built upon relationships like yours...which made me wonder who you know. Other companies or other business owners, who could use our help? Would you please introduce them to me? Before the referral call, you can also browse their Linkedin profile and look at who they have interacted with recently that you think might be a good customer for you. You can then call and say a specific name for a referral. Thank them and then qualify or quantify the referral: Your client gives you a name. When you first get that referral, quantify or qualify it with a question: “Thank you for that name. I’m curious, why do you think of Mr. / Ms. Customer would be interested in talking to me?” You’ll hear some insights as to whether there’s a need you should be aware of or if it’s just a good connection. Thank the person. When you receive referrals, thank the source. Show gratitude by giving gifts. If that is not allowed, at least send a thank-you note. This would be a real note, not an email. Then keep the person updated on the status of your new relationship. 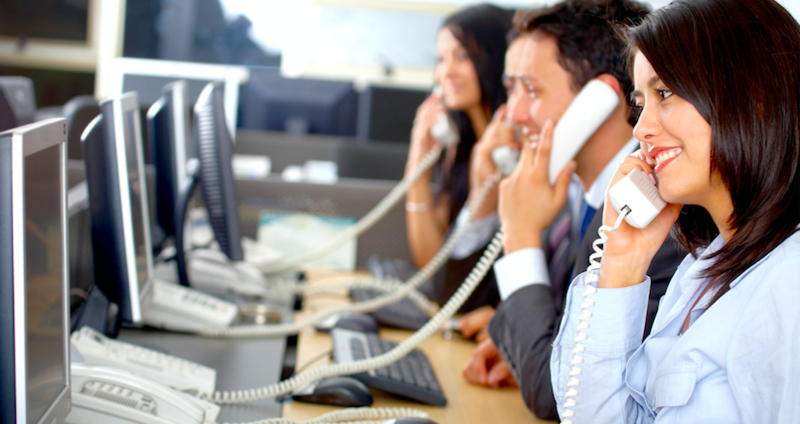 Telemarketing is a prospecting activity, inviting the person to come down to your business to have a look at the products you sell or asking them to purchase over the phone. You can offer the prospect a special offer on price, a bonus add-on, or a trial offer to test out your product. 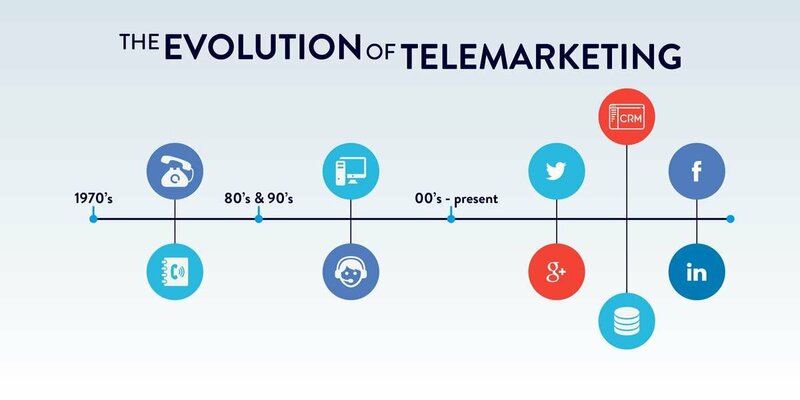 Telemarketing is a prospecting method that can get you instant results for today and tomorrow and can turn into sales very quickly. Building a database is critical for all businesses. Gaining a list of names and numbers of your current clients, ex-clients, and potential customers allows you to communicate with them on various levels, including promotions, newsletters, education, and fun activities. 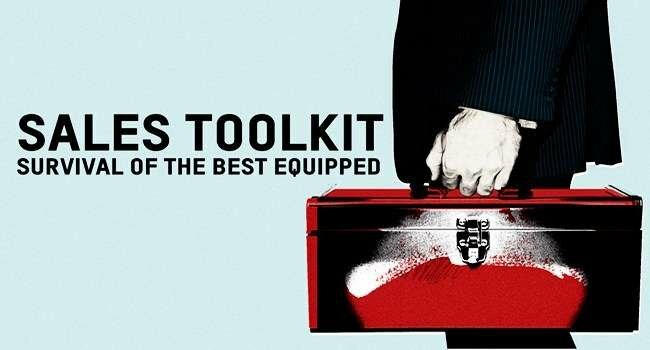 Databases can be built on specialist industry software or a basic excel spreadsheet. Obtain a range of information about your leads, including name, address, phone number, email address, and their specific needs for your product. All of these sources will have the contact information of potential customers who will need your printing services. Before calling, most people like to use a script. This will include who you are, why you are calling and what solutions you are offering. “Hi Pat, this Sandra Smythe from ABC Printing. We help businesses such as yourself increase sales through the printing and distribution of direct mail promotional brochures. Pat, I’m not sure if my services would be of benefit to your business but I’ve worked with other retailers in your industry helping them increase their customers and ultimately their sales. While this is a conventional cold calling script, I recommend using the telephone later in the marketing funnel and sales cycle if you are short on staff. If the person already knows you by name, whether it is through an email conversation or a conversation on Linkedin, the telephone is much more effective, if they are anticipating your call or at least know who you are. If they know who you are, it’s much easier to get past the gatekeeper. If they ask who you are you can say this is John from ABC Printing, im calling in regards to a conversation i had with Kelly on LinkedIn yesterday about printing magnetic calendars for her direct mail campaign. For example, if you are a commercial printer located in Kansas, you can search for local daily, weekly or business newspapers. Not only will ads be cheaper in local papers, it will give you proper targeting as well. Using Zip Code Geotargeting In Google Adwords, Display Ads, Facebook Ads and mobile ads. Placement ads on specific websites you are looking to target: Eg if you offer fridge magnet printing for dentists’ direct mail campaigns, you can buy ads on websites dentists frequently visit. At the end of the day, getting new customers is extremely crucial for businesses in the printing industry due to its competitive nature. So it is very important we explore ways to find and keep customers while still making a reasonable profit margin. We need to see which channel brings in new customers at the lowest cost, below customer lifetime value and then being able to scale customer acquistion. There are other channels for customer acquisition as well that is not mentioned. This includes SEO, guerilla marketing, Twitter, Instagram, Quora, Niche Forums, Youtube etc. While these platforms can be useful, you must test its effectiveness. To sum up, if you use all of these tactics and channels at the same time, there will be a guaranteed increase in prospects and customers. Make sure you are consistent in your efforts and make it a daily routine!